Isn't it Unscientific to posit God at the Beginning of the Universe? In this short 2 minute video, Dr. William Lane Craig responds to the objection that it is unscientific to say that God is the creator of the universe. Is the Roman Catholic Church the same as Christianity? Many people assume that Roman Catholicism is the same as Christianity. Thus, many unbelievers try and accuse Christians for the bad actions of the Roman Catholic Church. To counter this assumption, Matt Slick from CARM.org explains in this video why it is simply not true to say that the two are the same. He does this by giving various examples of key doctrines of which the Bible affirms and yet the Roman Catholic Church denies. What about those who've never heard? An objection that is brought up commonly in conversations with unbelievers is one regarding those that live in remote villages or islands and the fact that they have never heard of Jesus or the Bible. The question is raised, "How can God judge them for their actions when they have never heard about Him?" Greg Koukl, from Stand to Reason, in this 4-minute video provides us with an answer to this question. Is the Christian Faith blind? Does someone have to check their brain at the door in order to become a Christian? In this 2-minute video, Greg Koukl from Stand to Reason, addresses this question and outlines what the Biblical definition of faith is. If Eveything Needed a Creator, Then Who Created God? This is a very common objection that people bring up when discussing the Cosmological Argument. In this 1-minute video, Dr. William Lane Craig refutes the idea that God would did a creator for Himself. "As an atheist, I truly believe Africa needs God"
Before Christmas I returned, after 45 years, to the country that as a boy I knew as Nyasaland. Today it's Malawi, and The Times Christmas Appeal includes a small British charity working there. Pump Aid helps rural communities to install a simple pump, letting people keep their village wells sealed and clean. I went to see this work. It inspired me, renewing my flagging faith in development charities. But travelling in Malawi refreshed another belief, too: one I've been trying to banish all my life, but an observation I've been unable to avoid since my African childhood. It confounds my ideological beliefs, stubbornly refuses to fit my world view, and has embarrassed my growing belief that there is no God. Now a confirmed atheist, I've become convinced of the enormous contribution that Christian evangelism makes in Africa: sharply distinct from the work of secular NGOs, government projects and international aid efforts. These alone will not do. Education and training alone will not do. In Africa Christianity changes people's hearts. It brings a spiritual transformation. The rebirth is real. The change is good. I used to avoid this truth by applauding - as you can - the practical work of mission churches in Africa. It's a pity, I would say, that salvation is part of the package, but Christians black and white, working in Africa, do heal the sick, do teach people to read and write; and only the severest kind of secularist could see a mission hospital or school and say the world would be better without it. I would allow that if faith was needed to motivate missionaries to help, then, fine: but what counted was the help, not the faith. First, then, the observation. We had friends who were missionaries, and as a child I stayed often with them; I also stayed, alone with my little brother, in a traditional rural African village. In the city we had working for us Africans who had converted and were strong believers. The Christians were always different. Far from having cowed or confined its converts, their faith appeared to have liberated and relaxed them. There was a liveliness, a curiosity, an engagement with the world - a directness in their dealings with others - that seemed to be missing in traditional African life. They stood tall. At 24, travelling by land across the continent reinforced this impression. From Algiers to Niger, Nigeria, Cameroon and the Central African Republic, then right through the Congo to Rwanda, Tanzania and Kenya, four student friends and I drove our old Land Rover to Nairobi. We slept under the stars, so it was important as we reached the more populated and lawless parts of the sub-Sahara that every day we find somewhere safe by nightfall. Often near a mission. Whenever we entered a territory worked by missionaries, we had to acknowledge that something changed in the faces of the people we passed and spoke to: something in their eyes, the way they approached you direct, man-to-man, without looking down or away. They had not become more deferential towards strangers - in some ways less so - but more open. This time in Malawi it was the same. I met no missionaries. You do not encounter missionaries in the lobbies of expensive hotels discussing development strategy documents, as you do with the big NGOs. But instead I noticed that a handful of the most impressive African members of the Pump Aid team (largely from Zimbabwe) were, privately, strong Christians. “Privately” because the charity is entirely secular and I never heard any of its team so much as mention religion while working in the villages. But I picked up the Christian references in our conversations. One, I saw, was studying a devotional textbook in the car. One, on Sunday, went off to church at dawn for a two-hour service. It would suit me to believe that their honesty, diligence and optimism in their work was unconnected with personal faith. Their work was secular, but surely affected by what they were. What they were was, in turn, influenced by a conception of man's place in the Universe that Christianity had taught. There's long been a fashion among Western academic sociologists for placing tribal value systems within a ring fence, beyond critiques founded in our own culture: “theirs” and therefore best for “them”; authentic and of intrinsically equal worth to ours. I don't follow this. I observe that tribal belief is no more peaceable than ours; and that it suppresses individuality. People think collectively; first in terms of the community, extended family and tribe. This rural-traditional mindset feeds into the “big man” and gangster politics of the African city: the exaggerated respect for a swaggering leader, and the (literal) inability to understand the whole idea of loyal opposition. Anxiety - fear of evil spirits, of ancestors, of nature and the wild, of a tribal hierarchy, of quite everyday things - strikes deep into the whole structure of rural African thought. Every man has his place and, call it fear or respect, a great weight grinds down the individual spirit, stunting curiosity. People won't take the initiative, won't take things into their own hands or on their own shoulders. How can I, as someone with a foot in both camps, explain? When the philosophical tourist moves from one world view to another he finds - at the very moment of passing into the new - that he loses the language to describe the landscape to the old. But let me try an example: the answer given by Sir Edmund Hillary to the question: Why climb the mountain? “Because it's there,” he said. To the rural African mind, this is an explanation of why one would not climb the mountain. It's... well, there. Just there. Why interfere? Nothing to be done about it, or with it. Hillary's further explanation - that nobody else had climbed it - would stand as a second reason for passivity. Christianity, post-Reformation and post-Luther, with its teaching of a direct, personal, two-way link between the individual and God, unmediated by the collective, and unsubordinate to any other human being, smashes straight through the philosphical/spiritual framework I've just described. It offers something to hold on to to those anxious to cast off a crushing tribal groupthink. That is why and how it liberates. Those who want Africa to walk tall amid 21st-century global competition must not kid themselves that providing the material means or even the knowhow that accompanies what we call development will make the change. A whole belief system must first be supplanted. And I'm afraid it has to be supplanted by another. Removing Christian evangelism from the African equation may leave the continent at the mercy of a malign fusion of Nike, the witch doctor, the mobile phone and the machete. Hinduism is the world's third largest religion. As of 2004 there were approximately 800 million Hindus worldwide. What is Hinduism? What do its adherents believe? How do the teachings of Hinduism square with the Scriptures and how can a Christian best witness to a follower of Hinduism? Dr. Michael Ruse, an atheist philosopher of biology, speaks out against the "New Atheists". As a professional philosopher my first question naturally is: "What or who is an atheist?" If you mean someone who absolutely and utterly does not believe there is any God or meaning then I doubt there are many in this group. Richard Dawkins denies being such a person. If you mean someone who agrees that logically there could be a god, but who doesn't think that the logical possibility is terribly likely, or at least not something that should keep us awake at night, then I guess a lot of us are atheists. But there is certainly a split, a schism, in our ranks. I am not whining (in fact I am rather proud) when I point out that a rather loud group of my fellow atheists, generally today known as the "new atheists", loathe and detest my thinking. Richard Dawkins has likened me to the pusillanimous appeaser at Munich, Neville Chamberlain. Jerry Coyne, author of Why Evolution is True, says (echoing Orwell) that only someone with pretensions to the intelligentsia could believe the silly things I believe. And energetic blogger PZ Myers refers to me as a "clueless gobshite" because I confessed to seeing why true believers might find the Kentucky Creationist Museum convincing. I will spare you what my fellow philosopher Dan Dennett has to say about me. There are several reasons why we atheists are squabbling – I will speak only for myself but I doubt I am atypical. First, non-believer though I may be, I do not think (as do the new atheists) that all religion is necessarily evil and corrupting. This claim is on a par with golden plates in upstate New York. The Quakers and the Evangelicals were inspired and driven by their religion to oppose slavery, and a good thing too. Of course there has been evil in the name of religion – the pope telling Africans not to use condoms in the face of Aids – but as often as not religion is not the only or even the primary force for evil. The troubles in Northern Ireland were surely about socio-economic issues also, and the young men who flew into the World Trade Centre towers were infected by the alienation and despair of the young in Muslim countries in the face of poverty and inequalities. Second, unlike the new atheists, I take scholarship seriously. I have written that The God Delusion made me ashamed to be an atheist and I meant it. Trying to understand how God could need no cause, Christians claim that God exists necessarily. I have taken the effort to try to understand what that means. Dawkins and company are ignorant of such claims and positively contemptuous of those who even try to understand them, let alone believe them. Thus, like a first-year undergraduate, he can happily go around asking loudly, "What caused God?" as though he had made some momentous philosophical discovery. Dawkins was indignant when, on the grounds that inanimate objects cannot have emotions, philosophers like Mary Midgley criticised his metaphorical notion of a selfish gene. Sauce for the biological goose is sauce for the atheist gander. There are a lot of very bright and well informed Christian theologians. We atheists should demand no less. Third, how dare we be so condescending? I don't have faith. I really don't. Rowan Williams does as do many of my fellow philosophers like Alvin Plantinga (a Protestant) and Ernan McMullin (a Catholic). I think they are wrong; they think I am wrong. But they are not stupid or bad or whatever. If I needed advice about everyday matters, I would turn without hesitation to these men. We are caught in opposing Kuhnian paradigms. I can explain their faith claims in terms of psychology; they can explain my lack of faith claims also probably partly through psychology and probably theology also. (Plantinga, a Calvinist, would refer to original sin.) I just keep hearing Cromwell to the Scots. "I beseech you, in the bowels of Christ, think it possible you may be mistaken." I don't think I am wrong, but the worth and integrity of so many believers makes me modest in my unbelief. Fourth and finally, I live in the American South, surrounded by ardent Christians. I want evolution taught in the schools and I can think of no way better designed to make that impossible than to spout on about religion, from ignorance and with contempt. And especially to make unsubstantiated arguments that science refutes religion. I never conceal my nonbelief. I defend to the death the right of the new atheists to their views and to their right to propagate them. But that is no excuse for political stupidity. If, as the new atheists think, Darwinian evolutionary biology is incompatible with Christianity, then will they give me a good argument as to why the science should be taught in schools if it implies the falsity of religion? The first amendment to the constitution of the United States of America separates church and state. Why are their beliefs exempt? Back in 1961, in the depths of the cold war, terrified as we were by the threat of nuclear annihilation, John Whitcomb Junior and Henry Morris published The Genesis Flood, a six-day-creationist account of origins. Because of its dispensationalist message – God clears things out every now and then, as he did at the time of Noah, and we should expect the next (literal) blow up fairly shortly – it became the fundamentalist bible. But don't worry. It's all part of God's plans, even the Russian bomb. Today, nearly a decade after 9/11, terrified as so many still are by the terrorist threat, the atheistic fundamentalists are finding equally fertile soil for their equally frenetic messages. It's all the fault of the believers, Muslims mainly of course, but Christians also. But don't worry. In the God Delusion, we have a message as simplistic as in The Genesis Flood. This too will solve all of your problems. Peace and prosperity await you in this world, if not the next. Forgive me if I don't sign on. Fine Tuning: This argument (based on my understanding) is based on the assumption that life can only form under the conditions of our universe and only takes into account life as we know it. Is it not possible for life to form under different physical constants? If so, wouldn't the fine tuning of our universe be irrelevant to the question of God's existence? Moral Argument: You assert that objective morality comes about through God (to put it very simply). Isn't it just as plausible to see morality as something evolving from early homo sapiens and the development of different societies and civilizations and the necessities that follow from living in those societies? Couldn't morality have come about naturally through the demands of a society to conform to the norms? 1. Fine-Tuning. Your understanding of the argument is incorrect. See my exposition of the argument in Reasonable Faith, 3rd ed. When scientists talk about a universe's being life-permitting, they're not talking about just present forms of life. By "life" scientists just mean the property of organisms to take in food, extract energy from it, grow, adapt to their environment, and reproduce. Anything that can fulfill those functions counts as life. And the point is, in order for life so-defined to exist, whatever form it might take, the constants and quantities of the universe have to be unbelievably fine-tuned. You suggest that if the constants and quantities had had different values, then different forms of life might have evolved. But you're underestimating the truly disastrous consequences of a change in the values of these constants and quantities. In the absence of fine-tuning not even matter, not even chemistry, would exist, much less planets where life might evolve. Someone might think, "But maybe in a universe governed by different laws of nature, such disastrous consequences might not result." But this objection also betrays a misunderstanding of the argument. We're not concerned with universes governed by different laws of nature. We have no idea what such universes might be like! Rather we're concerned solely with universes governed by the same laws of nature but with different values of the constants and arbitrary quantities. The philosopher John Leslie gives the following illustration: imagine a solitary fly, resting on a large, blank area of the wall. A single shot is fired, and the bullet strikes the fly. Now even if the rest of the wall outside the blank area is covered with flies, so that a randomly fired bullet would probably hit one, nevertheless it remains highly improbable that a single, randomly fired bullet would strike the solitary fly within the large, blank area. In the same way, we need concern ourselves only with universes governed by the same laws of nature in order to determine how likely it is that one of them should be life-permitting. Because the laws are the same, we can determine what would happen if the constants and quantities were to be altered. And the results turn out to be disastrous. A life-permitting universe is like that solitary fly on the wall. 2. Morality. The answer to your questions is: It all depends! If God does not exist, then, as I've argued, what you say is exactly what moral values are: mere byproducts of biological and social evolution. But if God exists, then they're not. For the truth of a belief is independent of how you came to hold that belief. You may have acquired your moral beliefs through a fortune cookie or by reading tea leaves, and they could still be true. In particular, if God exists, then objective moral values and duties exist, regardless of how we come to learn about them. The socio-biological account at best proves that our perception of moral values and duties has evolved. But if moral values are gradually discovered, not invented, then our gradual and fallible perception of those values no more undermines their objective reality than our gradual, fallible perception of the physical world undermines its objective reality. So the real question is: do you think there is an objective distinction between good and evil, right and wrong? I'm sure you do. Philosophers who reflect on our moral experience see no more reason to distrust that experience than the experience of our five senses. I believe what my five senses tell me, that there is a world of physical objects out there. Similarly, in the absence of some reason to distrust my moral experience, I should accept what it tells me, that some things are objectively good or evil, right or wrong. Dr. James White of Alpha and Omega Ministries recently debated Imam Syed Z. Sayeed in Queens, NY, looking at the topic of Jesus in both the Bible and the Qur'an. 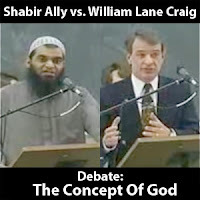 In 2007, Professors William Lane Craig and Lewis Wolpert undertook to debate each other on the topic of the existence of God. Below is a series of 4 reasonably short videos of the pretty humorous discussion that took place after the debate, moderated by BBC's John Humphrys. Human population growth. Less than 0.5% p.a. growth from six people 4,500 years ago would produce today’s population. Where are all the people? if we have been here much longer? “Stone age” human skeletons and artefacts. There are not enough for 100,000 years of a human population of just one million, let alone more people (10 million?). See Where are all the people? Length of recorded history. 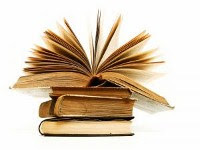 Origin of various civilizations, writing, etc., all about the same time several thousand years ago. See Evidence for a young world. Languages. Similarities in languages claimed to be separated by many tens of thousands of years speaks against the supposed ages (e.g. compare some aboriginal languages in Australia with languages in south-eastern India and Sri Lanka). See The Tower of Babel account affirmed by linguistics. Common cultural “myths” speak of recent separation of peoples around the world. An example of this is the frequency of stories of an earth-destroying flood. Origin of agriculture. Secular dating puts it at about 10,000 years and yet that same chronology says that modern man has supposedly been around for at least 200,000 years. Surely someone would have worked out much sooner how to sow seeds of plants to produce food. See: Evidence for a young world. Evidence of recent volcanic activity on Earth’s moon is inconsistent with its supposed vast age because it should have long since cooled if it were billions of years old. See: Transient lunar phenomena: a permanent problem for evolutionary models of Moon formation and Walker, T., and Catchpoole, D., Lunar volcanoes rock long-age timeframe, Creation 31(3):18, 2009. Recession of the moon from the earth. Tidal friction causes the moon to recede from the earth at 4 cm per year. It would have been greater in the past when the moon and earth were closer together. The moon and earth would have been in catastrophic proximity (Roche limit) at less than a quarter of their supposed age. Slowing down of the earth. Tidal dissipation rate of Earth’s angular momentum: increasing length of day, currently by 0.002 seconds/day every century (thus an impossibly short day billions of years ago and a very slow day shortly after accretion and before the postulated giant impact to form the Moon). See: How long has the moon been receding? Ghost craters on the moon’s maria (singular mare: dark “seas” formed from massive lava flows) are a problem for long ages. Evolutionists believe that the lava flows were caused by enormous impacts, and this lava partly buried other, smaller, impact craters, leaving “ghosts”. But this means that the smaller impacts can’t have been too long after the huge one, otherwise the lava would have hardened before the impact. This suggests a very narrow time frame for lunar cratering, and by implication the other cratered bodies of our solar system. They suggest that the cratering occurred quite quickly. See Fryman, H., Ghost craters in the sky, Creation Matters 4(1):6, 1999; A biblically based cratering theory (Faulkner); Lunar volcanoes rock long-age timeframe. The presence of a significant magnetic field around Mercury is not consistent with its supposed age of billions of years. A planet so small should have cooled down enough so any liquid core would solidify, preventing the evolutionists’ “dynamo” mechanism. See also, Humphreys, D.R., Mercury’s magnetic field is young! Journal of Creation 22(3):8–9, 2008. The outer planets Uranus and Neptune have magnetic fields, but they should be long “dead” if they are as old as claimed according to evolutionary long-age beliefs. Assuming a solar system age of thousands of years, physicist Russell Humphreys successfully predicted the strengths of the magnetic fields of Uranus and Neptune. Jupiter’s larger moons, Ganymede, Io, and Europa, have magnetic fields, which they should not have if they were billions of years old, because they have solid cores and so no dynamo could generate the magnetic fields. This is consistent with creationist Humphreys’ predictions. See also, Spencer, W., Ganymede: the surprisingly magnetic moon, Journal of Creation 23(1):8–9, 2009. Volcanically active moons of Jupiter (Io) are consistent with youthfulness (Galileo mission recorded 80 active volcanoes). If Io had been erupting over 4.5 billion years at even 10% of its current rate, it would have erupted its entire mass 40 times. Io looks like a young moon and does not fit with the supposed billions of year’s age for the solar system. Gravitational tugging from Jupiter and other moons accounts for only some of the excess heat produced. The surface of Jupiter’s moon Europa. Studies of the few craters indicated that up to 95% of small craters, and many medium-sized ones, are formed from debris thrown up by larger impacts. This means that there have been far fewer impacts than had been thought in the solar system and the age of other objects in the solar system, derived from cratering levels, have to be reduced drastically (see Psarris, Spike, What you aren’t being told about astronomy, volume 1: Our created solar system DVD, available from CMI). Methane on Titan (Saturn’s largest moon)—methane would all be gone because of UV-induced breakdown to ethane in just 10,000 years. And large quantities of ethane are not there either. Saturn’s rings are increasingly recognized as being relatively short-lived rather than essentially changeless over millions of years. The rate of change / disappearance of Saturn’s rings is inconsistent with their supposed vast age; they speak of youthfulness. Enceladus, a moon of Saturn, looks young. Astronomers working in the “billions of years” mindset thought that this moon would be cold and dead, but it is a very active moon, spewing massive jets of water vapour and icy particles into space at supersonic speeds, consistent with a much younger age. Calculations show that the interior would have frozen solid after 30 million years (less than 1% of its supposed age); tidal friction from Saturn does not explain its youthful activity (Psarris, Spike, What you aren’t being told about astronomy, volume 1: Our created solar system DVD; Walker, T., 2009. Enceladus: Saturn’s sprightly moon looks young, Creation 31(3):54–55). Miranda, a small moon of Uranus, should have been long since dead, if billions of years old, but its extreme surface features suggest otherwise. 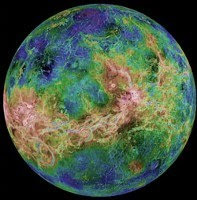 See Revelations in the solar system. Neptune should be long since “cold”, lacking strong wind movement if it were billions of years old, yet Voyager II in 1989 found it to be otherwise—it has the fastest winds in the entire solar system. This observation is consistent with a young age, not billions of years. See Neptune: monument to creation. Neptune’s rings have thick regions and thin regions. This unevenness means they cannot be billions of years old, since collisions of the ring objects would eventually make the ring very uniform. Revelations in the solar system. Young surface age of Neptune’s moon, Triton—less than 10 million years, even with evolutionary assumptions on rates of impacts (see Schenk, P.M., and Zahnle, K. On the Negligible Surface Age of Triton, Icarus 192(1):135–149, 2007. <doi:10.1016/j.icarus.2007.07.004>. Uranus and Neptune both have magnetic fields significantly off-axis, which is an unstable situation. When this was discovered with Uranus, it was assumed by evolutionary astronomers that Uranus must have just happened to be going through a magnetic field reversal. However, when a similar thing was found with Neptune, this AD hoc explanation was upset. These observations are consistent with ages of thousands of years rather than billions. The orbit of Pluto is chaotic on a 20 million year time scale and affects the rest of the solar system, which would also become unstable on that time scale, suggesting that it must be much younger. (See: Rothman, T., God takes a nap, Scientific American 259(4):20, 1988). The existence of short-period comets (orbital period less than 200 years), e.g. Halley, which have a life of less than 20,000 years, is consistent with an age of the solar system of less than 10,000 years. AD hoc hypotheses have to be invented to circumvent this evidence (see Kuiper Belt). See Comets and the age of the solar system. “Near-infrared spectra of the Kuiper Belt Object, Quaoar and the suspected Kuiper Belt Object, Charon, indicate both contain crystalline water ice and ammonia hydrate. This watery material cannot be much older than 10 million years, which is consistent with a young solar system, not one that is 5 billion years old.” See: The “waters above” . Lifetime of long-period comets (orbital period greater than 200 years) that are sun-grazing comets or others like Hyakutake or Hale–Bopp means they could not have originated with the solar system 4.5 billion years ago. However, their existence is consistent with a young age for the solar system. Again an AD hoc Oort Cloud was invented to try to account for these comets still being present after billions of years. See, Comets and the age of the solar system. The maximum expected lifetime of near-earth asteroids is of the order of one million years, after which they collide with the sun. And the Yarkovsky effect moves main belt asteroids into near-earth orbits faster than had been thought. This brings into question the origin of asteroids with the formation of the solar system (the usual scenario), or the solar system is much younger than the 4.5 billion years claimed. Henry, J., The asteroid belt: indications of its youth, Creation Matters 11(2):2, 2006. The lifetime of binary asteroids—where a tiny asteroid “moon” orbits a larger asteroid— in the main belt (they represent about 15–17% of the total): tidal effects limit the life of such binary systems to about 100,000 years. The difficulties in conceiving of any scenario for getting binaries to form in such numbers to keep up the population, led some astronomers to doubt their existence, but space probes confirmed it (Henry, J., The asteroid belt: indications of its youth, Creation Matters 11(2):2, 2006). The observed rapid rate of change in stars contradicts the vast ages assigned to stellar evolution. For example, Sakurai’s Object in Sagittarius: in 1994, this star was most likely a white dwarf in the centre of a planetary nebula; by 1997 it had grown to a bright yellow giant, about 80 times wider than the sun (Astronomy & Astrophysics 321:L17, 1997). In 1998, it had expanded even further, to a red supergiant 150 times wider than the sun. But then it shrank just as quickly; by 2002 the star itself was invisible even to the most powerful optical telescopes, although it is detectable in the infrared, which shines through the dust (Muir, H., 2003, Back from the dead, New Scientist 177(2384):28–31). The faint young sun paradox. According to stellar evolution theory, as the sun’s core transforms from hydrogen to helium by means of nuclear fusion, the mean molecular weight increases, which would compress the sun’s core increasing fusion rate. The upshot is that over several billion years, the sun ought to have brightened 40% since its formation and 25% since the appearance of life on earth. For the latter, this translates into a 16–18 ºC temperature increase on the earth. The current average temperature is 15 ºC, so the earth ought to have had a-2 ºC or so temperature when life appeared. See: Faulkner, D., The young faint Sun paradox and the age of the solar system, Journal of Creation (TJ) 15(2):3–4, 2001. Cometesimals. From his studies, astronomer Louis Frank says that 100 million tonnes of water is being added to Earth every year in cometesimals (small comet remnants). This has strong implications for the supposed age of the oceans, if confirmed. See: Bergman, J., Advances in integrating cosmology: The case of cometesimals, Journal of Creation (CENTJ) 10(2):202–210, 1996. The giant gas planets Jupiter and Saturn radiate more energy than they receive from the sun, suggesting a recent origin. Jupiter radiates almost twice as much energy as it receives from the sun, indicating that it may be less than 1 % of the presumed 4.5 billion years old solar system. Saturn radiates nearly twice as much energy per unit mass as Jupiter. See The age of the Jovian planets. Speedy stars are consistent with a young age for the universe. For example, many stars in the dwarf galaxies in the Local Group are moving away from each other at speeds estimated at to 10–12 km/s. At these speeds, the stars should have dispersed in 100 Ma, which, compared with the supposed 14,000 Ma age of the universe, is a short time. See Fast stars challenge big bang origin for dwarf galaxies. The ageing of spiral galaxies (much less than 200 million years) is not consistent with their supposed age of many billions of years. The discovery of extremely “young” spiral galaxies highlights the problem of this evidence for the evolutionary ages assumed. The number of type I supernova remnants (SNRs) observable in our galaxy is consistent with an age of thousands of years, not millions or billions. See Davies, K., Proc. 3rd ICC, pp. 175–184, 1994. The rate of expansion and size of supernovas indicates that all studied are young (less than 10,000 years). See supernova remnants. << Part 1 | < Part 5 | Part 7 coming soon. Carbon-14 in coal suggests ages of thousands of years and clearly contradict ages of millions of years. Carbon-14 in oil again suggests ages of thousands, not millions, of years. Carbon-14 in fossil wood also indicates ages of thousands, not millions, of years. Carbon-14 in diamonds suggests ages of thousands, not billions, of years. Incongruent radioisotope dates using the same technique argue against trusting the dating methods that give millions of years. Incongruent radioisotope dates using different techniques argue against trusting the dating methods that give millions of years (or billions of years for the age of the earth). Demonstrably non-radiogenic “isochrons” of radioactive and non-radioactive elements undermine the assumptions behind isochron “dating” that gives billions of years. “False” isochrons are common. Different faces of the same zircon crystal and different zircons from the same rock giving different “ages” undermine all “dates” obtained from zircons. Evidence of a period of rapid radioactive decay in the recent past (lead and helium concentrations and diffusion rates in zircons) point to a young earth explanation. Lead in zircons from deep drill cores vs. shallow ones. They are similar, but there should be less in the deep ones due to the higher heat causing higher diffusion rates over the usual long ages supposed. If the ages are thousands of years, there would not be expected to be much difference, which is the case (Gentry, R., et al., Differential lead retention in zircons: Implications for nuclear waste containment, Science 216(4543):296–298, 1982; DOI: 10.1126/science.216.4543.296). Pleochroic halos produced in granite by concentrated specks of short half-life elements such as polonium suggest a period of rapid nuclear decay of the long half-life parent isotopes during the formation of the rocks and rapid formation of the rocks, both of which speak against the usual ideas of geological deep time and a vast age of the earth. See, Radiohalos: Startling evidence of catastrophic geologic processes, Creation 28(2):46–50, 2006. Squashed pleochroic halos (radiohalos) formed from decay of polonium, a very short half-life element, in coalified wood from several geological eras suggest rapid formation of all the layers about the same time, in the same process, consistent with the biblical “young” earth model rather than the millions of years claimed for these events. Australia’s “Burning Mountain” speaks against radiometric dating and the millions of years belief system (according to radiometric dating of the lava intrusion that set the coal alight, the coal in the burning mountain has been burning for ~40 million years, but clearly this is not feasible). Existence of significant flat plateaux that are “dated” at many millions of years old (“elevated paleoplains”). An example is Kangaroo Island (Australia). C.R. Twidale, a famous Australian physical geographer wrote: “the survival of these paleoforms is in some degree an embarrassment to all the commonly accepted models of landscape development.” Twidale, C.R. On the survival of paleoforms, American Journal of Science 5(276):77–95, 1976 (quote on p. 81). See Austin, S.A., Did landscapes evolve? Impact 118, April 1983. The recent and almost simultaneous origin of all the high mountain ranges around the world—including the Himalayas, the Alps, the Andes, and the Rockies—which have undergone most of the uplift to their present elevations beginning “five million” years ago, whereas mountain building processes have supposedly been around for up to billions of years. See Baumgardner, J., Recent uplift of today’s mountains. Impact 381, March 2005. Water gaps. These are gorges cut through mountain ranges where rivers run. They occur worldwide and are part of what evolutionary geologists call “discordant drainage systems”. They are “discordant” because they don’t fit the deep time belief system. The evidence fits them forming rapidly in a much younger age framework where the gorges were cut in the recessive stage / dispersive phase of the global Flood of Noah’s day. See Oard, M., Do rivers erode through mountains? Water gaps are strong evidence for the Genesis Flood, Creation 29(3):18–23, 2007. Measured erosion rates at places like Niagara Falls are consistent with a time frame of several thousand years since Noah’s Flood. Erosion at Niagara Falls and other such places is consistent with just a few thousand years since the biblical Flood. River delta growth rate is consistent with thousands of years since the biblical Flood, not vast periods of time. The argument goes back to Mark Twain. E.g. 1. Mississippi—Creation Research Quarterly (CRSQ) 9:96–114, 1992; CRSQ 14:77; CRSQ 25:121–123. E.g. 2 Tigris–Euphrates: CRSQ 14:87, 1977. Underfit streams. River valleys are too large for the streams they contain. Dury speaks of the “continent-wide distribution of underfit streams”. Using channel meander characteristics, Dury concluded that past streams frequently had 20–60 times their current discharge. This means that the river valleys would have been carved very quickly, not slowly over eons of time. See Austin, S.A., Did landscapes evolve? Impact 118, 1983. Amount of salt in the sea. Even ignoring the effect of the biblical Flood and assuming zero starting salinity and all rates of input and removal so as to maximize the time taken to accumulate all the salt, the maximum age of the oceans, 62 million years, is less than 1/50 of the age evolutionists claim for the oceans. This suggests that the age of the earth is radically less also. The amount of sediment on the sea floors at current rates of land erosion would accumulate in just 12 million years; a blink of the eye compared to the supposed age of much of the ocean floor of up to 3 billion years. Furthermore, long-age geologists reckon that higher erosion rates applied in the past, which shortens the time frame. From a biblical point of view, at the end of Noah’s Flood lots of sediment would have been added to the sea with the water coming off the unconsolidated land, making the amount of sediment perfectly consistent with a history of thousands of years. Iron-manganese nodules (IMN) on the sea floors. The measured rates of growth of these nodules indicates an age of only thousands of years. Lalomov, A.V., 2007. Mineral deposits as an example of geological rates. CRSQ 44(1):64–66. The age of placer deposits (concentrations of heavy metals such as tin in modern sediments and consolidated sedimentary rocks). The measured rates of deposition indicate an age of thousands of years, not the assumed millions. See Lalomov, A.V., and Tabolitch, S.E., 2000. Age determination of coastal submarine placer, Val’cumey, northern Siberia. Journal of Creation (TJ) 14(3):83–90. Pressure in oil / gas wells indicate the recent origin of the oil and gas. If they were many millions of years old we would expect the pressures to equilibrate, even in low permeability rocks. “Experts in petroleum prospecting note the impossibility of creating an effective model given long and slow oil generation over millions of years (Petukhov, 2004). In their opinion, if models demand the standard multimillion-years geochronological scale, the best exploration strategy is to drill wells on a random grid.” Lalomov, A.V., 2007. Mineral deposits as an example of geological rates. CRSQ 44(1):64–66. Direct evidence that oil is forming today in the Guaymas Basin and in Bass Strait is consistent with a young earth (although not necessary for a young earth). Rapid reversals in paleomagnetism undermine use of paleomagnetism in long ages dating of rocks and speak of rapid processes, compressing the long-age time scale enormously. The pattern of magnetization in the magnetic stripes where magma is welling up at the mid-ocean trenches argues against the belief that reversals take many thousands of years and rather indicates rapid sea-floor spreading as well as rapid magnetic reversals, consistent with a young earth (Humphreys, D.R., Has the Earth’s magnetic field ever flipped? Creation Research Quarterly 25(3):130–137, 1988). Along the mid-ocean ridges, the detailed pattern of magnetic polarisation, with islands of differing polarity, speaks of rapid changes in direction of Earth’s magnetic field because of the rate of cooling of the lava. This is consistent with a young Earth. Measured rates of stalactite and stalagmite growth in limestone caves are consistent with a young age of several thousand years. See also articles on limestone cave formation. The decay of the earth’s magnetic field. Exponential decay is evident from measurements and is consistent with theory of free decay since creation, suggesting an age of the earth of less than 20,000 years. Excess heat flow from the earth is consistent with a young age rather than billions of years, even taking into account heat from radioactive decay. SeeWoodmorappe, J., 1999. Lord Kelvin revisited on the young age of the earth. Journal of Creation (TJ) 13(1):14, 1999. Radical folding at Eastern Beach, near Auckland in New Zealand, indicates that the sediments were soft and pliable when folded, inconsistent with a long time for their formation. Such folding can be seen world-wide and is consistent with a young age of the earth. Lack of plant fossils in many formations containing abundant animal / herbivore fossils. E.g., the Morrison Formation (Jurassic) in Montana. See Origins 21(1):51–56, 1994. Also the Coconino sandstone in the Grand Canyon has many track-ways (animals), but is almost devoid of plants. Implication: these rocks are not ecosystems of an “era” buried in situ over eons of time as evolutionists claim. The evidence is more consistent with catastrophic transport then burial during the massive global Flood of Noah’s day. This eliminates supposed evidence for millions of years. Thick, tightly bent strata without sign of melting or fracturing. E.g. the Kaibab upwarp in Grand Canyon indicates rapid folding before the sediments had time to solidify (the sand grains were not elongated under stress as would be expected if the rock had hardened). This wipes out hundreds of millions of years of time and is consistent with extremely rapid formation during the biblical Flood. See Warped earth. Polystrate fossils—tree trunks in coal (Auracaria spp. king billy pines, celery top pines, in southern hemisphere coal). There are also polystrate tree trunks in the Yellowstone fossilized forests and Joggins, Nova Scotia and in many other places. Polystrate fossilized lycopod trunks occur in northern hemisphere coal, again indicating rapid burial / formation of the organic material that became coal. Experiments show that with conditions mimicking natural forces, coal forms quickly; in weeks for brown coal to months for black coal. It does not need millions of years. Furthermore, long time periods could be an impediment to coal formation because of the increased likelihood of the permineralization of the wood, which would hinder coalification. Experiments show that with conditions mimicking natural forces, oil forms quickly; it does not need millions of years, consistent with an age of thousands of years. Experiments show that with conditions mimicking natural forces, opals form quickly, in a matter of weeks, not millions of years, as had been claimed. Evidence for rapid, catastrophic formation of coal beds speaks against the hundreds of millions of years normally claimed for this, including Z-shaped seams that point to a single depositional event producing these layers. Evidence for rapid petrifaction of wood speaks against the need for long periods of time and is consistent with an age of thousands of years. Clastic dykes and pipes (intrusion of sediment through overlying sedimentary rock) show that the overlying rock strata were still soft when it happened. This drastically compresses the time scale for the deposition of the penetrated rock strata. See, Walker, T., Fluidisation pipes: Evidence of large-scale watery catastrophe, Journal of Creation (TJ) 14(3):8–9, 2000. Para(pseudo)conformities—where one rock stratum sits on top of another rock stratum but with supposedly millions of years of geological time missing, yet the contact plane lacks any significant erosion; that is, it is a “flat gap”. E.g. Coconino sandstone / Hermit shale in the Grand Canyon (supposedly a 10 million year gap in time). The thick Schnebly Hill Formation (sandstone) lies between the Coconino and Hermit in central Arizona. See Austin, S.A., Grand Canyon, monument to catastrophe, ICR, Santee, CA, USA, 1994 and Snelling, A., The case of the “missing” geologic time, Creation 14(3):31–35, 1992. The presence of ephemeral markings (raindrop marks, ripple marks, animal tracks) at the boundaries of paraconformities show that the upper rock layer has been deposited immediately after the lower one, eliminating many millions of “gap” time. See references in Para(pseudo)conformities. Inter-tonguing of adjacent strata that are supposedly separated by millions of years also eliminates many millions of years of supposed geologic time. The case of the “missing” geologic time; Mississippian and Cambrian strata interbedding: 200 million years hiatus in question, CRSQ 23(4):160–167. The lack of bioturbation (worm holes, root growth) at paraconformities (flat gaps) reinforces the lack of time involved where evolutionary geologists insert many millions of years to force the rocks to conform with the “given” timescale of billions of years. The almost complete lack of clearly recognizable soil layers anywhere in the geologic column. Geologists do claim to have found lots of “fossil” soils (paleosols), but these are quite different to soils today, lacking the features that characterize soil horizons; features that are used in classifying different soils. Every one that has been investigated thoroughly proves to lack the characteristics of proper soil. 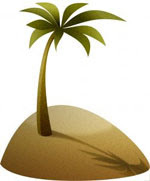 If “deep time” were correct, with hundreds of millions of years of abundant life on the earth, there should have been ample opportunities many times over for soil formation. See Klevberg, P. and Bandy, R., CRSQ 39:252–68; CRSQ 40:99–116, 2003; Walker, T., Paleosols: digging deeper buries “challenge” to Flood geology, Journal of Creation 17(3):28–34, 2003. Limited extent of unconformities (unconformity: a surface of erosion that separates younger strata from older rocks). Surfaces erode quickly (e.g. Badlands, South Dakota), but there are very limited unconformities. There is the “great unconformity” at the base of the Grand Canyon, but otherwise there are supposedly ~300 million years of strata deposited on top without any significant unconformity. This is again consistent with a much shorter time of deposition of these strata. See Para(pseudo)conformities. The amount of salt in the world’s oldest lake contradicts its supposed age and suggests an age more consistent with its formation after Noah’s Flood, which is consistent with a young age of the earth. The discovery that underwater landslides (“turbidity currents”) travelling at some 50 km/h can create huge areas of sediment in a matter of hours (Press, F., and Siever, R., Earth, 4th ed., Freeman & Co., NY, USA, 1986). Sediments thought to have formed slowly over eons of time are now becoming recognized as having formed extremely rapidly. See for example, A classic tillite reclassified as a submarine debris flow (Technical). Flume tank research with sediment of different particle sizes show that layered rock strata that were thought to have formed over huge periods of time in lake beds actually formed very quickly. Even the precise layer thicknesses of rocks were duplicated after they were ground into their sedimentary particles and run through the flume. See Experiments in stratification of heterogeneous sand mixtures, Sedimentation Experiments: Nature finally catches up! and Sandy Stripes Do many layers mean many years? Observed examples of rapid canyon formation; for example, Providence Canyon in southwest Georgia, Burlingame Canyon near Walla Walla, Washington, and Lower Loowit Canyon near Mount St Helens. The rapidity of the formation of these canyons, which look similar to other canyons that supposedly took many millions of years to form, brings into question the supposed age of the canyons that no one saw form. Observed examples of rapid island formation and maturation, such as Surtsey, which confound the notion that such islands take long periods of time to form. See also, Tuluman—A Test of Time. Rate of erosion of coastlines, horizontally. E.g. Beachy Head, UK, loses a metre of coast to the sea every six years. 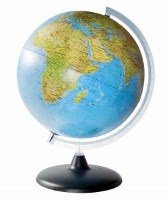 Rate of erosion of continents vertically is not consistent with the assumed old age of the earth. See Creation 22(2):18–21. 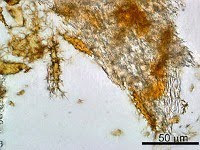 The finding of pliable blood vessels, blood cells and proteins in dinosaur bone is consistent with an age of thousands of years for the fossils, not the 65+ million years claimed by the paleontologists. DNA in “ancient” fossils. DNA extracted from bacteria that are supposed to be 425 million years old brings into question that age, because DNA could not last more than thousands of years. Lazarus bacteria—bacteria revived from salt inclusions supposedly 250 million years old, suggest the salt is not millions of years old. The decay in the human genome due to multiple slightly deleterious mutations each generation is consistent with an origin several thousand years ago. Sanford, J., Genetic entropy and the mystery of the genome, Ivan Press, 2005; see review of the book and the interview with the author in Creation 30(4):45–47,September 2008. This has been confirmed by realistic modelling of population genetics, which shows that genomes are young, in the order of thousands of years. See Sanford, J., Baumgardner, J., Brewer, W., Gibson, P. and Remine, W., Mendel’s Accountant: A biologically realistic forward-time population genetics program, SCPE 8(2):147–165, 2007. The data for “mitochondrial Eve” are consistent with a common origin of all humans several thousand years ago. Very limited variation in the DNA sequence on the human Y-chromosome around the world is consistent with a recent origin of mankind, thousands not millions of years. Many fossil bones “dated” at many millions of years old are hardly mineralized, if at all. This contradicts the widely believed old age of the earth. See, for example, Dinosaur bones just how old are they really? Dinosaur blood cells, blood vessels, proteins (hemoglobin, osteocalcin, collagen) are not consistent with their supposed age, but make more sense if the remains are young. Lack of 50:50 racemization of amino acids in fossils “dated” at millions of years old, whereas complete racemization would occur in thousands of years. Living fossils—jellyfish, graptolites, coelacanth, stromatolites, Wollemi pine and hundreds more. That many hundreds of species could remain so unchanged, for even up to billions of years in the case of stromatolites, speaks against the millions and billions of years being real. Discontinuous fossil sequences. E.g. Coelacanth, Wollemi pine and various “index” fossils, which are present in supposedly ancient strata, missing in strata representing many millions of years since, but still living today. Such discontinuities speak against the interpretation of the rock formations as vast geological ages—how could Coelacanths have avoided being fossilized for 65 million years, for example? See The “Lazarus effect”: rodent “resurrection”! The ages of the world’s oldest living organisms, trees, are consistent with an age of the earth of thousands of years. This post begins a series on the Age of the Earth. Many scientists say the Earth is millions, if not billions of years old, but this series of posts will provide 101 scientific reasons as to why that common belief is actually wrong. No scientific method can prove the age of the earth and the universe, and that includes the ones we have listed here. Although age indicators are called “clocks” they aren’t, because all ages result from calculations that necessarily involve making assumptions about the past. Always the starting time of the “clock” has to be assumed as well as the way in which the speed of the clock has varied over time. Further, it has to be assumed that the clock was never disturbed. There is no independent natural clock against which those assumptions can be tested. For example, the amount of cratering on the moon, based on currently observed cratering rates, would suggest that the moon is quite old. However, to draw this conclusion we have to assume that the rate of cratering has been the same in the past as it is now. And there are now good reasons for thinking that it might have been quite intense in the past, in which case the craters do not indicate an old age at all (see below). Ages of millions of years are all calculated by assuming the rates of change of processes in the past were the same as we observe today—called the principle of uniformitarianism. If the age calculated from such assumptions disagrees with what they think the age should be, they conclude that their assumptions did not apply in this case, and adjust them accordingly. If the calculated result gives an acceptable age, the investigators publish it. Examples of young ages listed here are also obtained by applying the same principle of uniformitarianism. Long-age proponents will dismiss this sort of evidence for a young age of the earth by arguing that the assumptions about the past do not apply in these cases. In other words, age is not really a matter of scientific observation but an argument about our assumptions about the unobserved past. The assumptions behind the evidences presented here cannot be proved, but the fact that such a wide range of different phenomena all suggest much younger ages than are currently generally accepted, provides a strong case for questioning those accepted ages (about 14 billion years for the universe and 4.5 billion years for the solar system). Also, a number of the evidences, rather than giving any estimate of age, challenge the assumption of slow-and-gradual uniformitarianism, upon which all deep-time dating methods depend. Many of these indicators for younger ages were discovered when creationist scientists started researching things that were supposed to “prove” long ages. The lesson here is clear: when the evolutionists throw up some new challenge to the Bible’s timeline, don’t fret over it. Sooner or later that supposed evidence will be turned on its head and will even be added to this list of evidences for a younger age of the earth. On the other hand, some of the evidences listed here might turn out to be ill-founded with further research and will need to be modified. Such is the nature of science, especially historical science, because we cannot do experiments on past events (see “It’s not science”). Science is based on observation, and the only reliable means of telling the age of anything is by the testimony of a reliable witness who observed the events. The Bible claims to be the communication of the only One who witnessed the events of Creation: the Creator himself. As such, the Bible is the only reliable means of knowing the age of the earth and the cosmos. See The Universe’s Birth Certificate and Biblical chronogenealogies (technical). In the end the Bible will stand vindicated and those who deny its testimony will be confounded. That same Bible also tells us of God’s judgment on those who reject his right to rule over them. But it also tells us of his willingness to forgive us for our rebellious behaviour. The coming of Jesus Christ, who was intimately involved in the creation process at the beginning (John 1:1–3), into the world, has made this possible (see Good news). In a lot of places in the world, Mormons come knocking on your door to spread their faith. Josh Williamson, along with Jon Speed, had a Mormon come to visit on the 7th October 2009 while in Dallas, Texas. They were able to record the discussion and undoubtedly, you'll sure be shocked at some of the things that the Mormon elder admits by the end of the conversation. For more Operation 513 resources, visit the Audios and Videos page. Buddhism is a religion that is definitely growing. It is now the 4th most practiced religion in America and has 350-500 million adherents worldwide. Because of this, one must be prepared to be able to respond to a Buddhist's objections to the Christian message and respond accordingly. To do this, it is very good to have a grasp of the teachings of Buddhism. The following resource from AlwaysBeReady.com can either be read or listened to, and contains a great overview of the history of Buddhism and its teachings. Also it contrasts the Buddhist religion to Christianity and gives tips on how to witness to people of that faith. Dan Barker, from the Freedom from Religion Foundation, has written a number of works where he argues that Jesus never existed. In this debate, James White, from Alpha and Omega Ministries, challenged Mr Barker on his claims. Amazingly, while James White was beginning his opening speech, Dan Barker objected to the quoting of his own book! Even though it was on sale that very day! In response to Rifqa Bary's claims that her life is in danger for converting to Christianity, many Muslims in the West are denying the fact that Muhammad commanded his followers to kill those who leave Islam. In this video, David Wood proves that, according to Muhammad himself, the penalty for apostasy is death. Why is Richard Dawkins so Popular? In this four minute video, Dr. William Lane Craig responds to the question about why Richard Dawkins seems to be so popular among atheists. The leading New Testament scholar from Cambridge, Dr. Richard Bauckham, was recently on the radio program 'Unbelievable?' which is on the Premier Christian Radio network. Bauckham was arguing that the Gospels are based on eyewitness accounts and therefore should be regarded as fundamentally trustworthy. Joining in on the discussion was also New Testament historian, Dr. James Crossley, discussing the implications of Bauckham's work and whether the Gospel of John was written by the disciple John himself, as Bauckham claims. It is well worth the listen. What do the Jehovah's Witnesses teach? Do you want a 4-minute crash course in what the Jehovah's Witnesses believe? Then watch this video by Matt Slick of CARM.org. The concept of God is remarkably different between the two biggest religions of the world, Islam and Christianity. However, the question must be asked: Which one is true, as both religions claim there is only one God? This debate was held at McGill University, in Quebec, Canada in February 2009. Note: Not all the views expressed in this debate by Dr. Craig are shared by Operation 513. How historically accurate is the Book of Mormon compared to the Bible? Do the places and events described in the Book of the Mormon have archaeological evidence backing them up? How does this compare to the Bible? Find out by watching this 1-hour video documentary by Living Hope Ministries.